Lol why do companies even bother with marketing like this. BTW been using my S4 on Tmobile for a week and no probs at all with my “new” uunlimited data requirements…..
Subject: Dean, what will it take to win you back? Subject: RE: Dean, what will it take to win you back? 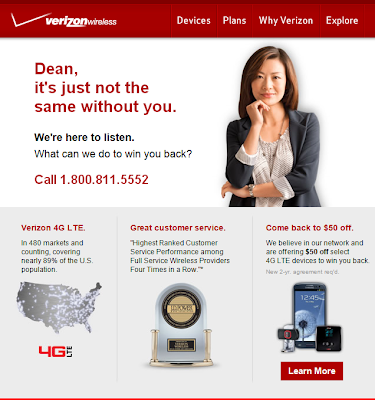 Frank the CFO of Verizon said recently …”We don’t think people really want unlimited data” so Verizon made a commercial decision no one on a grandfathered unlimited data plan could sign up for a new subsidized handset on a new 24 month plan eg. If you had unlimited you had to pay for your phone outright in order to continue with your plan (in effect paying for the phone twice in both cash upfront and on a higher plan cost per month).